It is eight months in the future. 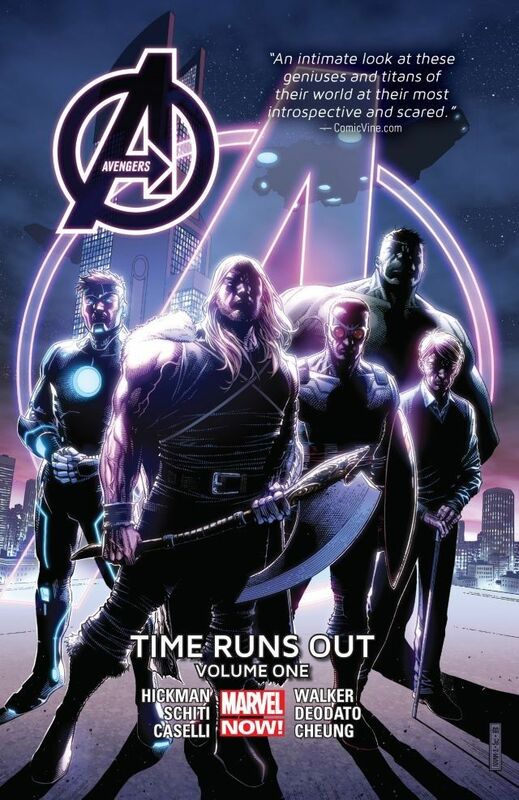 And the world has changed drastically in Jonathan Hickman’s Avengers: Time Runs Out Volume One. Our world has been at risk as the global incursions of other Earth’s in the multiverse collide with ours. And the steps taken to save the Marvel 616 Earth has created a whole new world. Will our heroes and world survive? As the story jumps forward everything has changed. The Avengers are now an arm of S.H.I.E.L.D. and they seek out the Illumanti, international outlaw heroes who took drastic measures to save the world. S.H.I.E.L.D. agent Susan Richards searches the world for her fugitive husband and the missing Tony Stark. Sunspot and his new business endeavor, A.I.M., works with Hyperion and his children to save the world. The Cabal led by Namor has killed other Earths, but Namor finds he has lost his soul in the process working with villains like Thanos. Sadly, the Cabal’s actions have been endorsed by the world worried for their own safety. Will the world survive is a question for future volumes of this story that Hickman has been slowly building up for years in both Avengers and New Avengers. Honestly, the jump forward is a little disjointing in a good way. The line-up of the Illumanti has changed. The map has changes as Wakanda has fallen. And as an extension of Avengers World, the Avengers and S.H.I.E.L.D. are fully integrated. It just takes some time to get you on your feet. But once you begin to get the lay of the land one begins to ask some questions like, is Hill or Steve Rogers in charge of S.H.I.E.L.D.? I have a hunch or two, but I know it will take another volume to get the question answered. And I have a lot of fun questions. There are some changes I really really like, especially around Sunspot and Cannonball. My favorite reveal is Sunspot bought A.I.M.! This is awesome and shows how Hickman has slowly set this up starting with a simple night out drinking with A.I.M. beekeepers. The two young Avengers have spent a lot of time learning about A.I.M. culture and I love seeing the yellow suits calling Sunspot sir, and Sunspot reorienting their evil ways for science. Meanwhile his best friend Cannonball has settled down into fatherhood with Smasher. And you get the sense that being a parent is more important to him that adventuring and I love seeing the advance in maturity. Sue Richards, agent of S.H.I.E.L.D.! This seemed like an easy jump for me since she showed up in Agent Coulson Team-Up. It really does seem like an evolution, especially with her husband on the run. And Reed Richards should be worried because you get the sense that this agent will get her man. Who will save the Earth? Is anyone up to this task? These are questions that still need to be asked and answered in future Hickman volumes. But so far, well done you have my attention!